The Chatrapati Sahuji Maharaj Kanpur University is one of the most popular Universities in Kanpur, Uttar Pradesh. 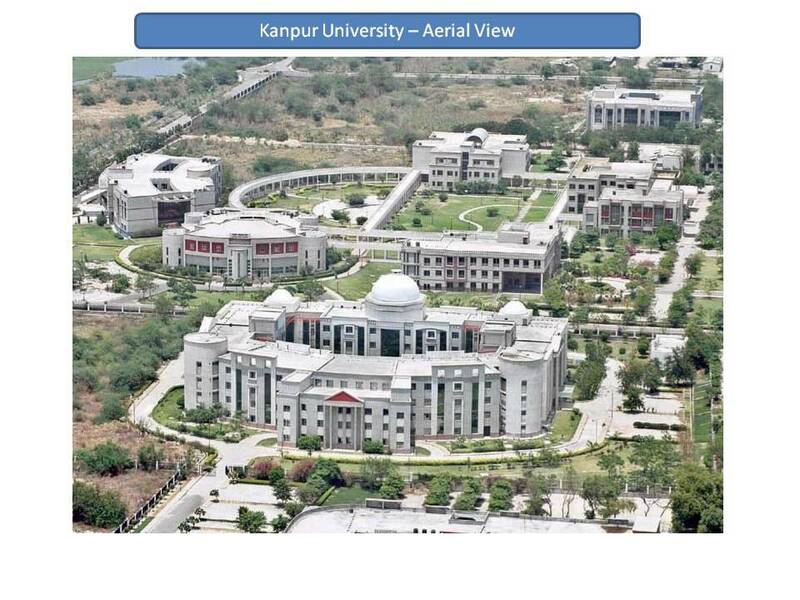 The kanpur university is a premier University that stands for higher education. It is the meeting place for students from all communities and religions in the world. The peaceful, tranquil and congenial ambience makes studying a pleasure. The University focuses on providing scholarships and benefits to each and every students. This Kanpur University is one of the oldest Universities for higher education for more than 3 decades. Shri Ram Nail presides as the honorable counselor of the University and he is also known to present the gift of fame medals to the best candidates. The Kanpur University administration has also been aware of its social and cultural commitments as well. The establishment of the Department of Adult and Continuing Education in the University, a Population Centre, Planning Forum and Women Study Centre are one of the most important achievements of the University in the recent times. The chancellor, Vice chancellor and member of the executive council hold position in office. Kanpur constitutes a body corporate in the name of “Chhatrapati Shahu Ji Maharaj University Kanpur” as well. Established in 1966, this Kanpur University has 170 affiliated colleges in 15 districts. The beautiful lush green campus is spread over 24 acres of land and is always booming with academics along with physical activities. The University offers various graduate and post graduate courses in all streams like Arts, Science, Commerce, law, Engineering and Medicine in the university as well as the affiliated colleges and Universities. The residential wings of the campus include various facilities of Life Sciences, Business management, English and Education. It has a computer centre, a department of Adult and Continuing education, a college development council and a department of Engineering and technology for young engineering aspirants that offers branches of Chemical, Computer Science and Information, Mechanical Engineering in the first instance. Kanpur which is known as the Manchester of North India has also contributed to the economic growth and development in India. By introducing a three years Degree course, the university has come in line with the other universities in the country. The Kanpur University is also known to be the best as focus in paid on games, sports, physical education, the National Cadet Corps and the National Service Scheme. Many students are also admitted on the basis of the sports quota that represents their University in various games all over the world. The University also believes in the increased use of Hindi for candidates who are not as fluent in English like the scheduled caste, scheduled tribes & the backward class. Kanpur University offers some of the best features and is rated as one of the best Universities with all kinds of features and facilities that would help students love the ambiance as well as the place of academics. It offers some of the best states of the art features and amenities for its students as well as its professors and it has been one of the best centers of attractions for many outsiders as well. Students from India as well as from abroad also come to study in this University. Nationalized banks– The University campus also has two nationalized banks like the Union Bank of India and the Bank of Baroda. These banks have been designed to cater to the needs of the students. The banks are fully equipped with ATM and core banking facilities. These banks also offer short term and long term loans for their students. Cafeteria– Relax in the beautiful cafeteria after long and stressful hours. They are always occupied by students and teachers and have a lot of delicious food at affordable prices. The cafeteria is open 6 days in a week where students also celebrate birthdays and give treats. The cafeteria is one of the most beautiful places where students love to spend their time. Central Library– The Central library has a vast assortment of various books. Choose from a collection of lacs of books. Besides a huge collection of books, there are seven campuses of the University that comprise of various volumes of bound journals, Ph D dissertations, M..Phil books, reports, maps, newspapers, patents, newspapers, microfilms, proceedings of conferences, manuscripts, CD ROMs. Computer Center– The University also has a state of the art computer center which is well equipped with various computers that cater to the academic requirement of students. The computer center provides a hand on experience for new students as well. The faculty and the students have free access to the internet and the lab is also equipped with advanced computer systems, line printers, laser printers, scanner, CD writers, zip drives and more. The center offers Diploma in Computer Applications, Post graduate diploma in Computer science and also implements new academic programs. The university Guest House– the Guest House has been furnished for special guests and VIPS who come to the University. They have well furnished rooms with excellent catering service. The guest house is situated at walking distance from banks and the administrative buildings. The University guest house has large banquet halls which are used for breakfast and dinner for all participants during conferences. Helipad grounds– This University has its own helipad.This helipad has been specially built to invite dignitaries and VIPs.The Helipad is big enough to accommodate three choppers at a time. High profile guests are bought into the chopper. Hostels – The University is also known to have 3 well furnished girls’ hostels with a capacity of 500 inmates, and a boy’s hostel with the capacity of 400 inmates. All the hostels have mess facilities at cheap and affordable rates along with 24 ours power supply, TV, reading room, common rooms, telephones, recreation and sports facilities with tight security. International center– The International Center comprises of luxurious guests and visitors in the university. The grand building is situated at the far end of the campus between beautiful surrounding and is adorned with fountains. Multipurpose hall – The Multipurpose hall is situated in the centre of the University Campus. It can hold around 1000 people at a time. The hall can be used for indoor games like tennis m badminton, cultural programs like classical dance, debates, cartooning, Rangoli, mimicry, college youth festivals and badminton game. Shopping complex -The internal shopping complex that is located in the centre of the University provides all kinds of commodities for daily life like toiletries, books, daily wear, grocery, clothes, and other commodities. The shopping complex also comprises of a Xerox machine for the students. Stadium -There is a huge stadium in the University campus which is used for sports activities like 400 meter. race, hammer throw, long jump, high jump, cricket tournament ,football, hockey, basketball, handball, volley ball, tennis, kabaddi, kho-kho and more games. Apart from that there are other facilities like Botanical games, Campus School and more. Chatrapati Sahuji Maharaj Kanpur University is one of the most well known universities not only in India but all throughout the world. It has some of the best professors teaching specialized subjects. Each and every student has a camps placement opportunity. Chatrapati Sahuji Maharaj Kanpur University offers students a variety of courses ranging from Science, Arts and Commerce. So what is the scope after graduating from Chatrapati Sahuji Maharaj Kanpur University? There are various fields that you can try your luck in after graduation and post graduation from Chatrapati Sahuji Maharaj Kanpur University. You can work in various sectors of the society. Chatrapati Sahuji Maharaj Kanpur University also has a number of online courses that you can choose from. There are various advantages of studying in the University. This University is one of the most well known Universities in the world due to which students from this university are known by their education and degree in the outer world as well. Different courses have different eligibility factors according to the course and the duration of the course. You need to go through the prospectus well in order to know the requirements and the eligibility criteria of being selected for the course. All candidates need to be prospective candidates who have done well in the previous examination with a 55% and above marks in the aggregate for Graduation and post graduation. In order to know more about the different courses offered in the University you can check out http://www.minglebox.com/college/Chhatrapati-Shahu-Ji-Maharaj-University-Kanpur/courses or https://targetstudy.com/university/317/chhatrapati-sahu-ji-maharaj-university-kanpur-university/course/. You can check out the University website for the different cut off and eligibility marks and then applies for the same. The Online entrance form starts on 20th March 2017. Online exam to be conducted on 30th may 2017. The Kanpur University examination entrance tests would be held in various UG and PG courses. Each test is conducted in a particular date and a particular time. The various exam details and the time can be found out from the Admit Card. The Admit Card can be obtained from the official websitewww.kanpuruniversity. Org. The admit card is an important document that should always be carried on the day of the examination. Admit Cards are also available athttp://kanpuruniversity.org/ac_ver/Frm_EntranceAdmitCard.aspx. Some of the forms for admission are in Hindi which may be visible after some time. The admission forms provide detailed information regarding all kinds of documents and necessary information that is required from and by the candidates. You can download forms online or also get these forms on payment of cash from the University Counter itself. The different admission forms can be downloaded from different links which are given in the University website. You can also click on the URL http://www.kanpuruniversity.org/application_forms.htm to know about the information of form downloads. You can view the University website to know more about the admission forms, their eligibility criteria and the dates. Fill up all the carefully one by one from the personal information to payment information. You cannot jump to the next section before filling up one the previous section. Press on the save button of the particular page and then continue on the next page. Before submitting the form you can go to the payment submission page and print the draft form to check the availability of the data that is inserted by the user. The data can also be modified and saved for later use. Here are some of the quick links that you can use for downloading the application form. The results of different subject courses can be viewed in the websitehttp://www.kanpuruniversity.org/imp_dates_results.htm. All kinds of results in the University would be declared in this webpage. You can also find out about the counseling schedules Phil English vacant seats, Counseling of other subjects, Admission notice for left over seats and more in the website. Different courses are charged differently for different duration’s periods. A BBA, BCA and B Sc in Bio Informatics course fee would cost18000 Rs, B Lib is 20000 Rs, B Tech Course would be 40000 Rs, M. Sc, MCA,MBA, MBE,MTM, M Lib, and MP Ed would cost 24000 Rs, Diploma in Computer Application is 6215 Rs, Advance P.G. Dip. in Bioinformatics is 24000 Rs, M.Sc, in Life Science is 5300 Rs, MA in English is 945 Rs, Paramedical and all associated degrees are 40500 Rs. Is that an option where you can download Kanpur University college books? Nowadays the online technology has gained grounds and many people are downloading books from various websites instead of buying the same. There are options wherein you can download books from the Kanpur University. There are a number of websites from where you can download books of Kanpur University. You can either purchase books from them by paying by demand draft or you can also download their books from various different websites. Open e source books can be downloaded from https://bookfiz.com/csjm-kanpur-university-scheme-of-ba-2016-17.asp/.You can also download a number of online e books from https://sahityabhawan.com/index.php?route=product/category&path=59_63_216_217. Just go to the website, select the subject and the book you are looking for, type search and start browsing for your book. The best e books for all subjects are available in the website. All books are written as per the syllabus. These books are also known to cater to the needs of students for all subjects which are taught in the University. You can choose from a wide range of books either for free or for a minimal course. What is the cost for the application fees? The Application fees for General and IOBC are 600 Rs, while for SC and ST it is 400 Rs.The application fees can be paid through online banking by using credit card/debit card/net banking or through challan.The fees can be paid in the banks inside the campus as well as other centers. You can check out different kinds of websites to search for the results of the Kanpur University entrance exams as well as the UG and PG examinations. You can also check out the following websites for updated results. The results will also be published in all the leading newspapers in UP as well as gazettes that are published on the day of the results. The websites are also available in the University website. Where can you find Kanpur University job vacancies? You can also apply online for the latest recruitments from their website. You can also login to http://www.opengovtjobs.in/kanpur-university/55242/ or http://www.freejobalert.com/kanpur-university/376164/ for more details on job vacancies. The University of Kanpur frequently publishes notices and circulars o recruit fresher’s or experienced qualified job seekers for teaching and non teaching posts. In order to know more about the recruitments, visit the Kanpur University website or current and upcoming University of Kanpur jobs notifications for the year 2017 & 2017-18. Kanpur University is recently recruiting for Teaching Faculty & Technical Asst Posts and has announced notification for the recruitment of Assistant Professor & Technical Assistant vacancies on contract basis. Eligible candidates can walk in on 04, 05, 06, 07, 11 & 13-07-2017 at 11:00 AM. You can find all the details, the qualifications required for the post and the number of vacancies in the University website. Are you someone who would either like to sell your old books or would like to buy new books or exchange your books with different people for convenience? Tradly is the best place to do so in a seamless and hassle free manner.Tradly is a safe and friendly platform where people can connect with each other to sell, buy and swap different kinds of books, goods and other commodities. The app is absolutely free and it can also be accessed via mobile.. So what is it that tradly is really loved for? Buy, sell, swap and give away you old books in exchange of new ones. Tradly is gaining momentum pretty fast and has now overpowered well known social sites like Flip kart and OLX. The Tradly platform has been developed with a safe and friendly local community to discover and connect using the platform for a wide assortment of things. The app is free and instant via mobile. Tradly is also known to have ease of use and has numerous fun features as well Tradly is a social platform where people from all across the community can engage themselves by the option of chatting. This app also comes with an unique feature that allows users to discover products nearby local areas, based on the product type and category. This app is also Follow and Chat with their much loved people in order to know more about them and buy, sell, donate and swap their used or new items without any listing cost. This App has been downloaded by a number of users including school and college students, people who love reading and book lovers. It strives to improve itself with a number of enhanced features. It also has a smooth payment Gateway method that makes transactions smooth.